Kansas turkey habitat presentation to develop reasonable expectations. Intent is to remove as much habitat mystery as is possible by pictures. These habitat snapshots should make boots on ground time easier. As a do it yourself hunter organization we do emphasize first we will assist with getting every hunter to a good spot to park his truck to step out to scout or hunt. Or, good habitat. That is easy. Remainder is where all challenges come in. We know a spring tom rarely falls into a hunter’s lap. We administer all land to insure pressure is not an issue. Knowing what good habitat looks like is just one step. 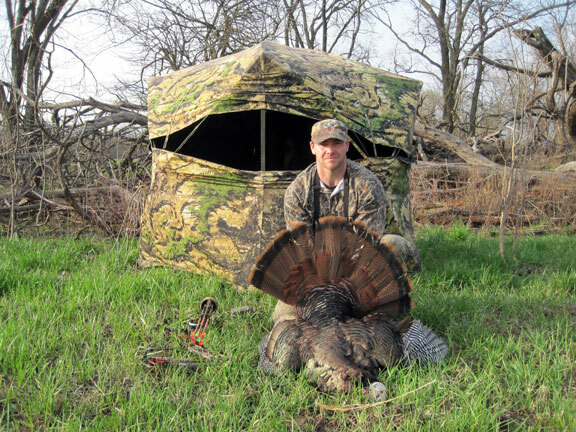 Have a look at a member’s spring turkey hunt video. View it for its background habitat not so much as its tom. Some have expressed concern about insuring they do not cross property lines. 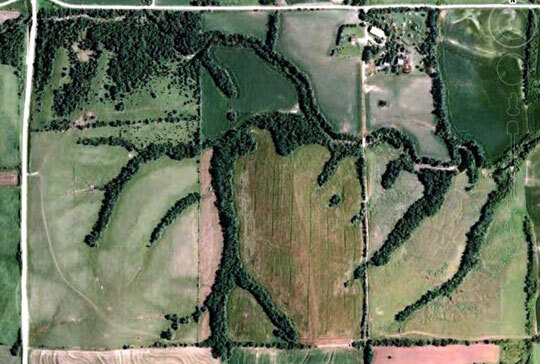 This pictures is of a 240 acre Kansas farm. All property lines are easily visible. It happens to have been over years of owners been divided into three 80 acre spots by addition of fence lines clearly visible in its aerial. A good example of habitat to be sought. Combination of grass, grain crop, woody. Through as many such aerial and ground level snap shots as we can illustrate we hope an idea of Kansas turkey habitat comes through. A jake strutting to a mouth call. Notice his background thin woody cover. Typical of what we recommend to many as a spring season spot. No better proof than live pictures such as these to show habitat. Below. 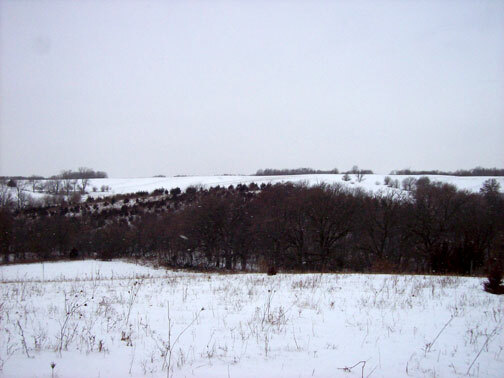 Kansas turkey habitat in winter. Its value is illustrating just how thin and small wood lots are where flocks occupy. This wood lot is a good sized one in Kansas at less than 10 acres. A point we find required to repeatedly present as many big woods hunter who travel out our way become concerned about lack of woody habitat. One contrast which does come through is after after harvest when a big woods hunter picks up his open crop ground tom finding its weight immediately identifiable as greater than what he has taken before. 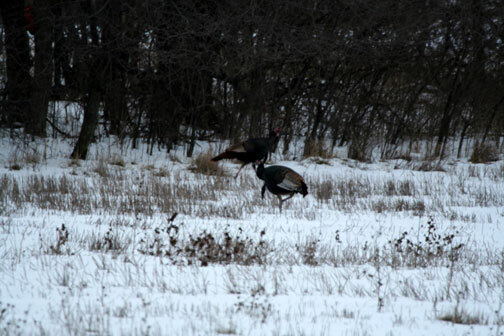 Grain land toms by some accounts are around 5 pounds heavier than a northern woods state bird. Just two toms along a small wood lot edge shown above in this middle afternoon picture series. Bleak, but productive habitat. This picture also shows just how easy it is to deer then turkey hunt or scout some same spots. Notice all are out in an open field, not in their nearby (roost) wood lot. This pictures does well to show how late into winter a grain field holds waste grain. Sufficient to bring in both deer and turkey. In this case a soybean field. A second point of value is it shows typical winter snow ground cover. Common to have snow ground cover as long as up to 2 weeks before a melt off. All added together to make a greater understanding of Kansas turkey habitat. It is more about food than cover. Another aspect we emphasize is attitude. Hunters his first season is setting himself up for years of field days to come. Turkey or otherwise. This second aspect of years of field days to come does not mean a first or current hunt will not be good. It means rather hunts yet to come will get better. Difference being experience with specific private leases derived from multiple visits. What has been observed is one price must be paid and paid directly by hunters alone. A price of ground time both scouting then hunting. This observation continues in regard to our recommendations to every hunter’s own scouting. No matter how good any recommendations to any hunter of where to start or, of his own scouting his first season, by his third season he will be on entirely different ground. 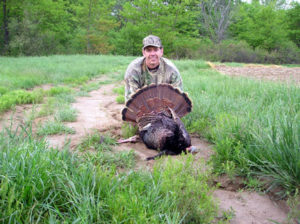 Typically, by his third season few hunters hunt their first season properties. Most have found spots they like better with every trip. Soon all get to a point of cutting off future new land scouting focusing entirely on hunting. Later, adventure of discovery of new land gains hold. His land knowledge process starts a new. Tracking flocks year round helps to know where they will be come spring. When we recommend someone to a lease it is not an accident. If we recommend a farm and no tom harvested we will call it a bad day. If a same hunter does not get a tom on come a second recommended farm then we will suspect something other than a lack of birds. This picture shows just how bleak ground cover is at opening week of Kansas’s long spring season. Some would call it poor habitat if not for seeing birds on it. By Kansas’ last week of spring season green up is well along. What typically happens is hunters breaks-in his first season. 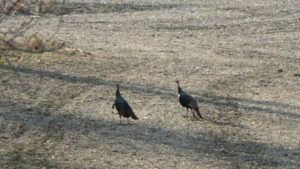 He returns to spring turkey hunt or any of preferred fall seasons. He begins to expand out. Covering more ground. In general half of any leases he looks at will disappoint him. Another half will be of habitat meeting perspective of what good ground should be. Another half will be ignored only to be discover later as good spots once time on land is gained. 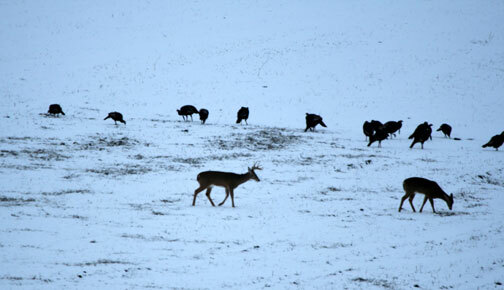 This third half soon becomes more important as it is concluded Mr. Whitetail or Mr. Tom Turkey know better where they want to be than hunters are at picking it from aerials. Time on land thing again. Paid by hunters only. No way around it. If not willing to pay it a guided operation is more suitable. After a few trips most have direct knowledge of more leases than time to hunt. A point which begins a priority according to first hunting interest, second habitat quality to third branching out into secondary interests. Soon a tranquility arises of having plenty of choices free from others. This grows into removal of frustration and growing satisfaction come any trips end of having hunted enough. By this time a hunter has become a true self guided hunter. He is planning his own hunts simply uses MAHA to make reservations.